Attorney General Jeff Sessions’ decision to block entry into the U.S. by asylum seekers citing fears of domestic abuse or gang violence doesn’t leave many options for those facing persecution in Mexico and Central America, University of San Diego immigrant expert Everard Meade said Tuesday. On Monday, Sessions reversed a 2014 immigration appeals court ruling that granted asylum to a Salvadoran woman who said her former husband beat and raped her for 15 years. Sessions can overturn such decisions because immigration courts are housed under the Justice Department, not the government’s judicial branch. 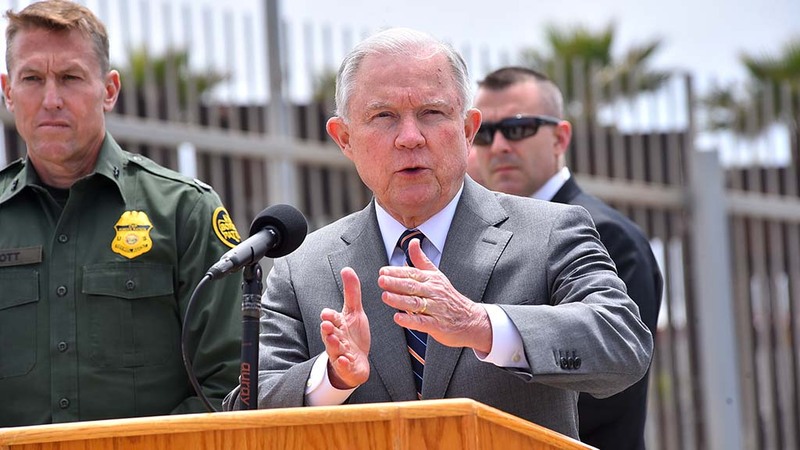 In his ruling, Sessions claimed that recent asylum precedent has become overly broad to include victims of “private violence,” such as domestic or gang-related violence. To claim asylum, most seekers will instead have to show they have been persecuted by their government, as might happen to a religious minority or political activist. But most asylum claims are borne of the types of violence that Sessions ruled against on Monday, said Meade, who directs USD’s Trans-Border Institute and has served as an expert witness in several asylum cases involving Mexican nationals. Sessions has previously said too many immigrants take advantage of asylum rules as a way to enter the U.S. But in 2016, for every applicant who succeeded, more than 10 others also sought asylum, according to Department of Homeland Security data. It’s difficult for someone to prove during an asylum claim that they’re a victim of domestic violence, or that a gang has targeted their family, Meade said. Asylum isn’t an efficient or effective solution for domestic violence victims, Meade said. Apart from the low approval record, applications can take months or years to process. However, Meade said that Sessions’ lack of any proposed solution for affected asylum seekers leaves them at risk. “Women who have been repeatedly raped, severely beaten, scarred — they’ve appealed to police in their countries and received death threats. These are very serious cases, and there’s zero policy discussion about the responsibility of the U.S., or anybody, to protect these women,” he said. Studies also indicate tougher asylum policies don’t necessarily discourage immigrants from traveling to the U.S., Meade said. Instead, primary factors include persecution in the country of origin as well as job and economic prospects in the prospective arrival country. “People are desperate and they’re lucky if they leave with any of their personal belongings. They go on a harrowing journey through Mexico where they risk torture and kidnapping — they’re not thinking about the minutiae of U.S. immigration policy or how cases are adjudicated,” he said. In the meantime, asylum seekers denied access to the U.S. by immigration officials can still seek appeals in federal courts. Few cases make it to that level because of the considerable legal resources required, but Monday’s policy reversal could lead to a regionalization in the handling of cases that are heard. The 9th Circuit Court of Appeals, headquartered in San Francisco, is generally thought to be more permissive than the 5th Circuit Court of Appeals in New Orleans. By extension, someone who appeals their asylum case to one court could have a completely different result than someone who appeals their decision somewhere else, Meade said.